Faye Auchenpaugh of Thief River Falls, MN is a member of the Northwest Minnesota Arts Council’s (NWMAC) Board of Directors. She talks about her love of art, her work on the NWMAC Board and other aspects of supporting the arts and culture of northwest Minnesota. 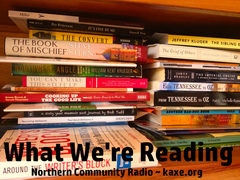 Tammy Bobrowsky reviews The Girl With All the Gifts, Let’s Go Fishing!, and we hear listen-reader reviews of Dear Mr. You, and Being Mortal.